A 91-year-old artist, whose work has been compared to that of LS Lowry, is to receive honorary degrees from two Greater Manchester universities. Frances Lennon, born in Urmston, Trafford, recently received an MBE for her contribution to the Arts & Charity. 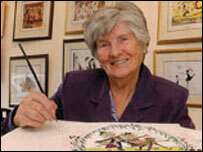 The painter was also named the official artist of the Commonwealth Games when it was held in Manchester in 2002. She will be honoured by The University of Salford on Wednesday and Manchester Metropolitan University on Friday. Ms Lennon will receive her honorary degree from The University of Salford in a ceremony at The Lowry. Her second degree will be given to her at The Bridgewater Hall. 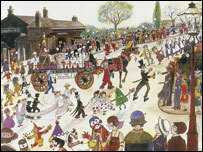 Dubbed "The People`s Artist", she was made famous for her colourful street scenes showing children playing. She has published several books, including "A Manchester Childhood" and "Trafford Childhood."